Ed and Agnes-Hannah Friel spent part of their childhoods around the Mill Point Federal Prison camp, where both had parents working as federal prison officers and they met as children. The Mill Point Federal Prison camp was opened in 1938 for low level federal prisoners and work was immediately begun on construction of the road from Mill Point to Richwood, Route 39. 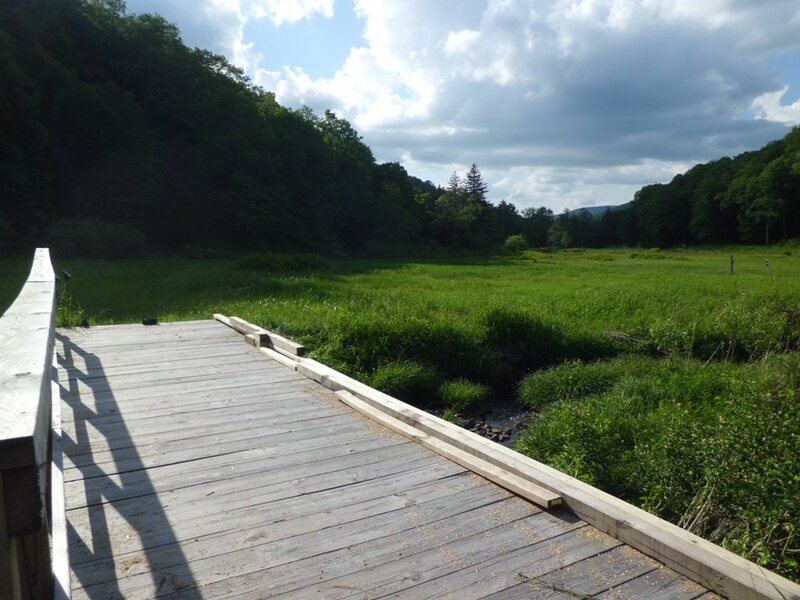 The camp was situated high in the mountains in what is now part of the Cranberry Wilderness of the Monongahela National Forest in Pocahontas County. View of the prison camp, 1943. From the collection of Ed Friel. “There were moonshiners, tax cheats, maybe inmates who’d been in Atlanta, or Leavenworth, or something like that, had got into their 50’s and were deemed safe. But there were a number of conscientious objectors, including some famous Hollywood writers,” explains Ed, whose father Carl was head of lumber operations at the prison camp. In the 1940s there was an influx of Conscientious Objectors who were sent to the camp during the Second World War. Writer Howard Fast spent three months at the prison camp for refusing to testify to the House Committee on Un-American Activities in 1950. There, he wrote his most famous novel, Spartacus. In all likelihood, there is no prison like Mill Point in the whole world. Not that it is a resort. It’s a prison, but one turned toward the reclamation not the destruction of men. It’s a prison without walls, without cells, without guns or clubs–a prison that embodied the most daring thinking of modern penology. And it works, and has worked, guietly and efficiently for twenty years (click here to read more). 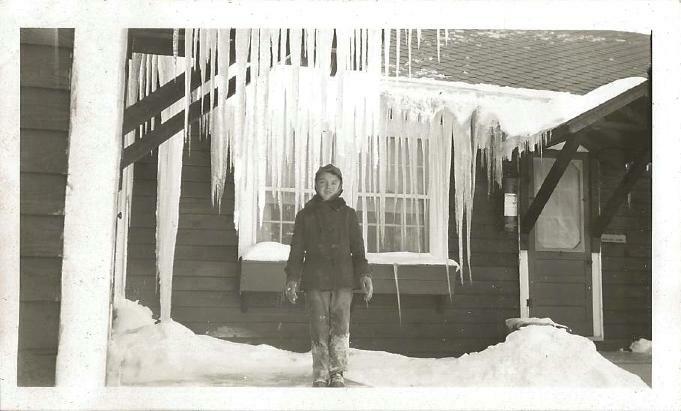 Ed Friel in front of the family house above the prison camp, 1950. From the collection of Ed Friel. Ed and Agnes-Hannah Friel remember growing up around the prison camp, which had no walls, but merely a was surrounded by a “single strand of cable,” with posts that informed “the inmates that to step over that cable was considered an escape.” Both Carl Friel and Houston Simmons (Agnes-Hannah’s father) worked with inmates on the logging operations at the camp, before it closed in 1953. 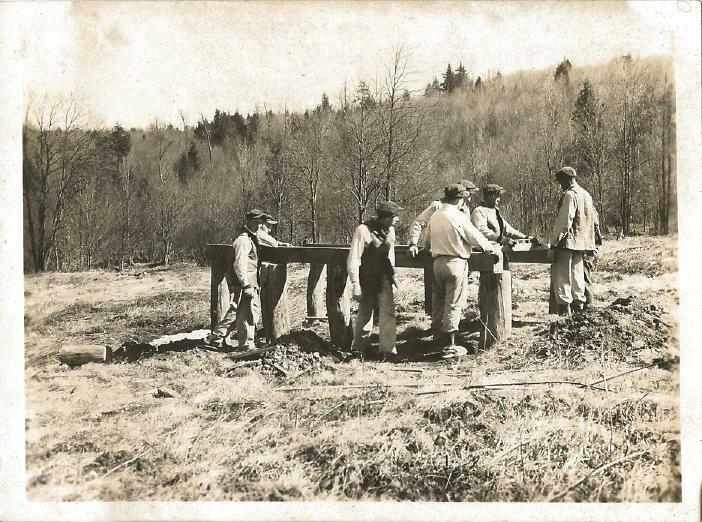 Inmates building the sawmill at the camp, 1943. From the collection of Ed Friel. The prison was closed down in 1959, and both inmates and officers were scattered to different places across the country. But both the Friel and the Simmons family moved to Chillicothe, Ohio, where there is a larger federal prison. Ed and Agnes Hannah eventually married, and today they continue to return to Pocahontas County, maintaining the family farm that overlooks the Greenbrier River. 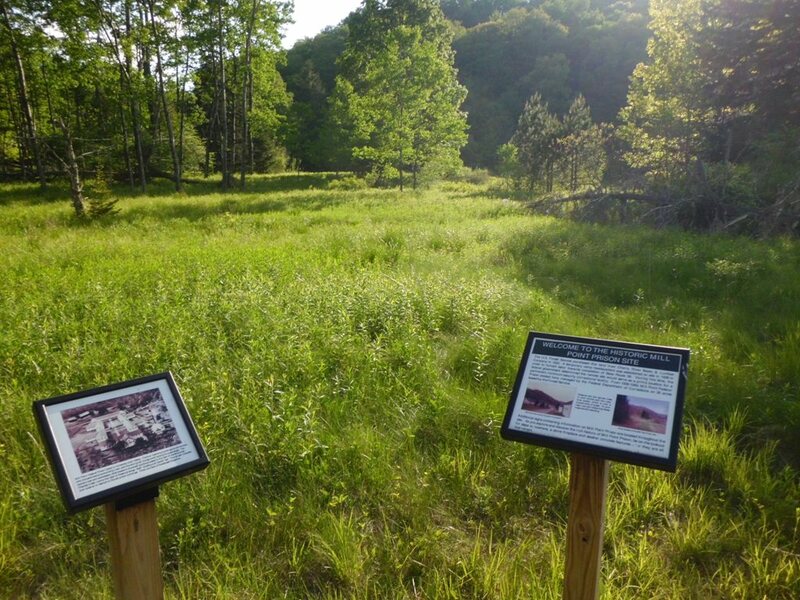 Today, visitors can still find some remains of the prison camp up in the Monongahela National Forest, and Forest Service interpretive signs at the site provide great information for interested hikers. Interpretive signs at the former site of the prison camp. 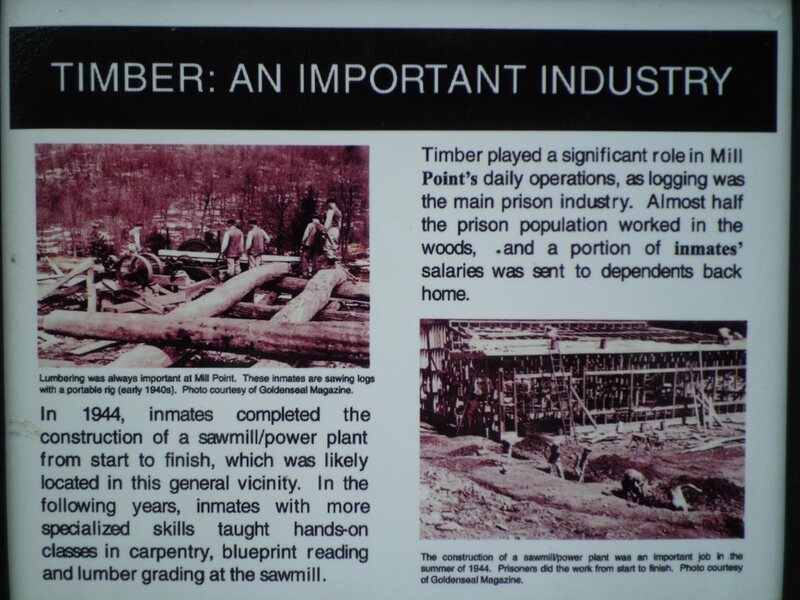 “Timber: An Important Industry.” An example of one of the interpretive sign up at the former site of the prison camp. What it looks like today. Former site of the prison camp in the Cranberry Wilderness. Sources: Crockett, Maureen. Doing Time on Kennison Mountain: Pocahontas County’s Forgotten Prison. Goldenseal, (Spring 1985). 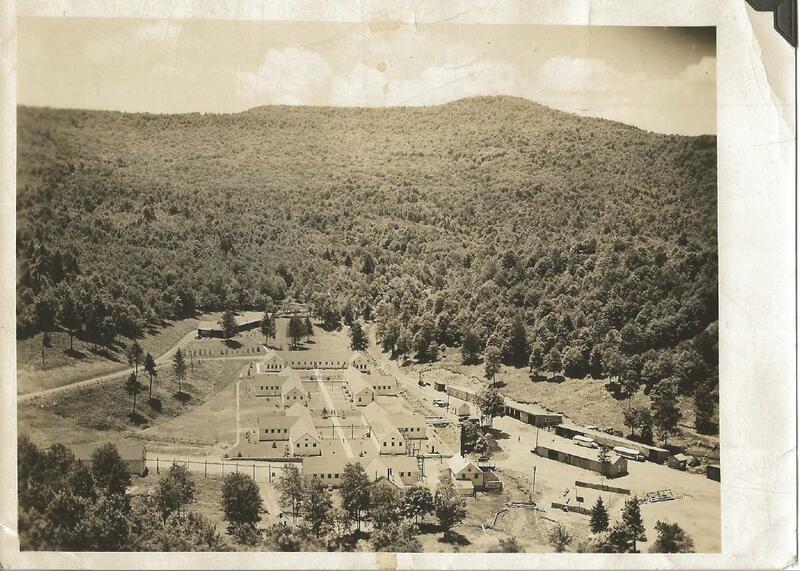 Crockett, Maureen F. “Mill Point Prison Camp.” e-WV: The West Virginia Encyclopedia. 20 October 2010. Web.